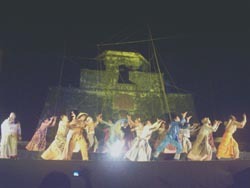 MARIBOJOC - A world-class musical drama by a community theater rendered at the foot of the centuries old watchtower is the latest in culture and history pedagogy now making a hit in Bohol. Here, a community theater tells the story in a brilliant weaving of music and dance. 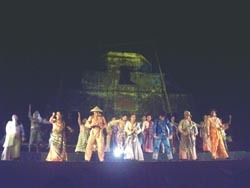 The artistic cultural presentation retells the infamous pangayaw raids of the moro Tirones, one that would force the people to fortify for themselves and build a stone watchtower for their defense and organize an armada of boat riding men to meet the raiders and engage them in battle at sea. Pangayaw is a traditional pillaging of moro tribes in the region for gold, food and slaves to be sold to rich sultans in Mindanao in the 17th century. Performed by local Cultural Collective at the foot of the centuries old watchtower, the Castillo del San Vicente Eco-Heritage Tour officially opened with much fanfare Thursday, December 18 at the Punta Cruz Complex in Maribojoc. Mayor Leoncio Evasco, in an interview before the musical and artistic rendition of the tour’s main highlight aired his elation over the outcome of their effort to help the community. Aided by a funding agency partner and assisted by an NGO, the government and contacted artists, the mayor said the town has developed livelihood and enterprise as well as harnessed young talents in the area. Along with Bohol Alliance of Non-Government Organizations in a project called Building Livelihood Enterprise in Support for Sustainable Eco-Tourism (BLESSED) in Maribojoc, the local government has also effectively reclaimed the town landmark from it’s an image as just one of the many heritage towers here, but as a root of local history and culture becoming a major crux of tourism activities. “Along the process, the Punta Cruz Cultural Collective, a community theater comprised by 21 artists who went through the Basic Integrated Theater Arts Workshop was established” creative and artistic consultant Lutgardo Labad said. “The soft launching turned out to be a major event which opened eyes to the historical realities that shaped the local culture and tradition,” admits a Maribojoc local artist who witnessed the 30 minute artistic performance. Performed at the foot of the 17th century watchtower venerated to San Vicente Ferrer, the brilliant dramatization of historic moro raids intricately weaves the past with the present, reinstating the towering role of the heritage structure in the lives of Maribocjanons, shared a retired teacher too awed by the performance. Trained local artists from barangays Punta Cruz, Guiwanon, Lagtangon and Bood all of Maribojoc staged the dramatization using classic pangalay (southern temple worship dance) choreography, indigenous instrumentation and the age-old chanted narration to thread the entire story line. At the opening rites, PACAP Bohol project coordinator May Blanco hailed the town for the integration of culture, empower-ment, conservation and history to develop economic and livelihood opportunities for communities. 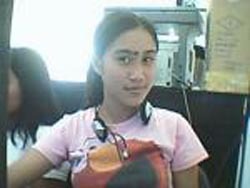 She pointed out that several development plans overlook the crucial culture and environment, but now Maribojoc. The Castillo del San Vicente Eco-heritage Tour is unlike your other stops that takes about 15 minutes. This is may be an hour-long tour featuring local guides, cultural presentations, souvenir item shopping and the soon to open marine protected area guided tours, Fritzie Mae Zamora tells. 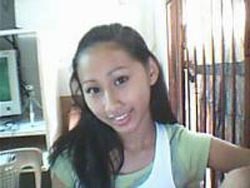 Zamora coordinates Bangon tourism assisted events and also helps communities develop tourism support products. MARIBOJOC - Nasikop ang duha ka mananagat ingon man ang ilang panagatan dihang mipahigayon ug Seaborn Patrol ang mga tinugyanan sa balaod ning lungsod kaniadtong Huwebes (Nob. 20). Ang duha ka panagatan gipanag-iya nila ni Rogelio Jaluag hingkod ang panuigon nagpuyo sa Tutolan Dauis samtang ang usa gipanag-iya usab ni Recardo Panso mulopyo usab sa samang dapit. Ang duha gireklamo nga nakahimo ug kalapasan sa ordinanace no. 479 series of 1991 ang mga malapason gipamulta sa 2,500 matag-usa ug girelease lang usab dayon human makabayad sa laud nga ilang nahimo. MARIBOJOC - The Abatan River, declared as the kayaking and water sports capital of the Province of Bohol under Sangguniang Panlalawigan Resolution No. 2007-512, again successfully celebrated the yearly “Abatan River Kayak Festival and Dragon Boat Racing 2008. The exciting Festival featured three different races: a mini adventure relay race, a kayak sprint race and a dragon boat fun race. Participants and guests were treated to free kayak clinics and instructions after which they were allowed to ride and paddle their kayaks under the watchful eyes of accomplished paddlers. The dragon boat clinic had the participants view a Power Point presentation and demons-trations. The coach then ins-tructed the participants to do stretching exercises before they were allowed to hold the paddles and ride the dragon boats. The mini adventure relay race with six teams participating, had the Maribojoc home team, “Team Gakajo” easily take First place honors. Coming in a close second was Process Foundation’s “Team Otimo” who incidentally had Provincial Board Member Ae Damalerio as one of its kayak paddlers. Third-place honors went to “Team Bangan” of Bohol Xtreme. The race of four members to a team sent one team member swimming across the Abatan River, another running on the bridge and 2 members paddling, one downstream and the other upstream of the Abatan River. The dragon boats which could zip through the waters at speeds that are hard to match even by motor powered bancas, had a fun race that had four teams participating. These were Team Maribojoc Red and three other composite teams which were a mixture of guests and seasoned dragon boat paddlers of the Team Maribojoc Blue. As expected the Team Maribojoc Red handily won over the rest of the composite teams. The Kayak Sprint Race had ten contestants racing upstream of the Abatan and back. The course estimated to be at least a kilometer was negotiated in less than five minutes. This race was again dominated by the Maribojoc Paddlers, with Justice Alcala taking the First place finish. Jerome Eyas came in as a close second, while Junjun Elcana came in third. Through the efforts of Mayor Boy Evasco, Bohol is fortunate to have two dragon boats, making Bohol the first province outside of Manila to have dragon boats in the country. These boats are an added attraction for the Abatan River. With the Kayaks and now the Dragon Boats, the Abatan River is now on its way to becoming Bohol’s adventure destination, with the support of the Province and the private sector, it is hoped that this vision could become a reality. MARIBOJOC - Mayor Leoncio Evasco called on Maribojocanons to unite some more in a bid to transform their 5th-class town into an economic, social and cultural dragon in Bohol. “We now have two dragon boats and as you may learn later, we need to paddle together to move forward under the rhythm of the drum and according to the direction of the steerer,” as he addressed the people gathered at the town sports gymnasium and cultural center. Using the analogy during his State of Governance Address (SOGA) marking his first year in governance, the mayor hinted the town’s tourism potentials as a major investment, as he revealed the town’s receipt of two dragon boats to complement Abatan River Tour. “Abatan River is envisioned to be the site for Aqua Sports,” he said. Floating rafts with a spa and coffee shop is already in operations and soon the two dragon boats are to see action in the river, he added. He said the present efforts concentrate on integrated resource management in community development especially in eco-tourism and in strengthening its socio-economic base. The town executive shared that the present development plans involve the communities and integrate them with the projects. Over this, he assured that a significant proportion of the benefits would be redistributed at the level of the host community. “Eco-cultural tourism must benefit the local population economically and culturally to provide them incentives to protect the natural resources which create the attractions,” he explained to Maribocjanons gathered at the town gymnasium. Stating the town’s vision as a socially vibrant, economically efficient and ecologically sustainable community, Evasco said the town’s Executive Legislative Agenda has to be based on multi-stakeholder consultations in its plotting the town roadmap. 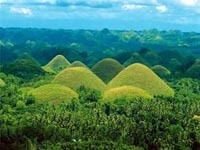 Humbly admitting that after a year, with barely enough resources, the administration has barely scratched surface, he pressed that with their dependence on local resources has pushed the administration to go for programs that minimize the adverse effects on the natural environment and enhance the cultural integrity of the local people. “The main goal is to enable the people to enjoy and learn about the natural, historical and cultural characteristics of the unique environments while preserving the integrity of these sites and stimulating the economic development opportunities in local communities,” he added. Moreover, the veteran administrator of the country’s largest city before he joined local politics told the people of the cooperation they forged with city academes in master planning for Boloc-boloc Spring. As things are slowly set up, he also bared that promotions and marketing activities have been done in coordination with agencies.